1. Heat 100ml water in a large saucepan. Tip in the frozen risotto and cook gently, stirring frequently for 5 minutes until smooth and slightly thickened. 2. 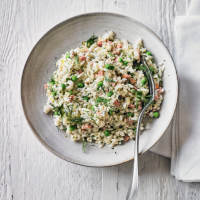 Add the gammon, petit pois or peas and dill and cook for a further 5 minutes until the risotto is thick, creamy and piping hot. Add a little more water if the mixture dries out. Stir in the crème fraîche if using and serve in shallow bowls. Cook’s tip Replace the water with leftover dry white wine for a slightly richer flavour and finely grate the ends of any well-flavoured hard cheese for sprinkling on top.